Which fats are you cooking with? Some fats are actually dangerous, while some help prevent disease and weight gain. This ultimate good fats vs bad fats guide crushes myths and set the record straight, so that you can live your fittest life, lose weight, or keep your ideal weight. Can I cook with Canola oil (and other unflavored oils)? Alright, so to get started with the good fat versus bad fat, I’m going to get started with a very, very, very bad fat. The one that I need to begin with is the most exceedingly awful of all is the canola vegetable safflower oil and others that are unflavored. These are the oils that you would prefer not to use to cook with or to make a serving of salad dressing. Oils don’t actually have flavors and so we can’t unflavored it. They don’t make your food taste good. What makes it more very unhealthy is the way they extract these oil from a vegetable, safflower or canola, totally unnatural. The big food companies rely on an extraction process that is extremely processed and not very healthy. They do use chemicals and heat to extract the oil. 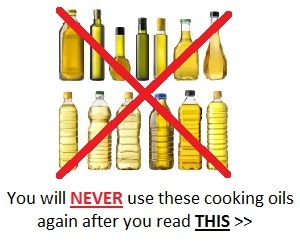 My first advice is to get rid of any unflavored oil like safflower, canola & vegetable oil. What is Extra Light Olive Oil? According Kitchnn, extra light olive oil is a refined oil that has a neutral taste and a higher smoke point. It can be used for baking, sautéing, grilling, and frying. The word “light” is used as a marketing term that describes that the oil has a lighter flavor. It doesn’t mean that the oil is lower in calories. This is not actually light, the taste might be light because it’s not very good. In fact, it’s horrible! If you were going to taste it, take a little teaspoon and taste it, it would be horrible. Light olive oil is an oil that is blended with the unflavored oil. It’s a little bit of a very bad quality olive oil. Get rid of it, please. Now, the other one is the pure olive oil and it has nothing pure about it. Pure, sounds like a good term but this is another marketing word that the company used so they can sell more. Pure olive oil is actually a tiny fraction of extra-virgin olive oil that is mixed with another unhealthy unflavored oil.So please, no light, no pure olive oil. Only extra-virgin olive oil. Now, another one that I don’t use too much is butter. There’s nothing wrong with butter. Butter is actually good. In fact, it’s much better than margarine, for example. I encourage you to actually cook with butter. One problem with butter is that there’s a lot of saturated fat in it plus it burns very quickly. The smoke point of butterfat is very low, so we cannot really sear or sauté something with butter, at least not with 100% butter. You can do a mix of extra-virgin olive oil and butter but if it’s only butter, it’s a bad idea because it burns quickly and nobody wants burned fat into their own body. Right? Can I cook with Extra-Virgin Olive Oil? Now here’s what everything you need to know about olive oil. I’ve mentioned a lot of times about olive oil & how you should get rid of pure olive oil, light olive oil or just olive oil. As a matter of fact, if it doesn’t say extra-virgin olive oil, just don’t use it. Extra-virgin olive oil is the best olive oil because it has the most nutritional value and also has the best tasting. There’s a serious panel of experts that do test the oils and then taste it. They test it to make sure that the acidity is extremely low because the lower the acidity, the great nutritional value. If you would like to savor it, you can actually do it by yourself. Just take a little teaspoon, pour a bit of extra-virgin olive oil and then taste it. You’ll be surprised to see the difference between all the olive oils that you have in your supermarket. In fact, there might be 20 to 30 different olive oils in any supermarket in America. Now which one to use? You know that’s a big question. There are two different kinds of olive oil that I would like to recommend. First is the extra-virgin olive oil which can be organic or not, but I prefer organic though. I used it to cook, to sear chicken or fish, and to sauté vegetables like zucchini or mushroom. Now, the second kind of extra-virgin olive oil that I use for salad dressings is called estate olive oil and they’re actually a very good one. These are extra-virgin olive oil of the month club which I got from Spain and Portugal. Don’t get me wrong, there’s plenty of extra-virgin olive oil that is fantastic from California, France, Italy, Greece, or Turkey. It’s called estate because these olive oils are usually from a small family or a very small production somewhere in the countries that I just mentioned. They make olive oils with pride and they put the name of the estate on it. And just like very good wine, they take a lot of pride in making of these extra-virgin olive oil and to give you an idea, it will cost around $25-$30 per bottle. It might be expensive but these are ideal for drizzling. You just need a few drops. I do encourage you to have two different kinds of extra virgin olive oil: one, bigger volume a little more affordable so you can actually sear, sauté and cook with it, and the estate olive oils that are usually in the dark glass bottle, still extra-virgin and first cold-pressed. According to Proteco, cold pressing refers to oils obtained through pressing fruit or seeds with a modern steel press. Cold pressed oils to retain all their flavour, aroma, and nutritional value, making these oils great for cooking and skin care requirements. First pressed means that olive oils are crushed and pressed once. The first olive oil extracted from the pressing is of the highest quality and purity. Now the cold-pressed according to Texas Olive Ranch means that the olives never exceed a certain temperature during the entire pressing process–around 80 degrees Fahrenheit. Keeping the olives cooler will ensure the maximum quality and heating produces lower quality olive oil. So choose a first cold-pressed and then select two kinds, one that you can afford that’s probably $15 for a big two liters. So that’s about two quarts. Then spend a little bit of money like $25-$30 for a small bottle of estate olive oil as these are much more better-quality that comes from Spain, Italy, Greece, France, California, Australia or South Africa. Having an estate olive oil, you don’t even need vinegar or even salt and pepper. Just drizzle it over grilled fish, meat or vegetables. Some beautiful greens or just some tomato and mozzarella and basil that’s all in it. There’s also a bunch of oils that I really like and I call them the specialty oils. Specialty oils are oils that are a bit more expensive. We have pumpkin seed oil, white truffle oil, a walnut oil, grapeseed oil and also the sesame seed oil. Sesame seed oil is great because you can cook it with all kind of Asian dishes. It does keep the taste. All of those oil gives a lot of taste and that’s why we use them, but we don’t use them to cook so much except sesame olive oil. Sesame olive oil is great to actually do a stir-fry for your vegetables, shrimp, fish, or chicken. I use walnut and grapeseed oil to drizzle on the salad because it gives kind of a nice taste. For the truffle oil, this is actually kind of a big scam. Most of the black truffle oil and white truffle oil don’t actually have any truffle in them. How does that happen? I don’t know but it just doesn’t. It tastes like it but doesn’t have any kind of black or white truffle oil. You can spend quite a little of money to have an olive oil that is blended with some truffle but that’s actually very rare. Here’s another kind of oils, these two are fairly new to the marketplace. A couple of years ago, nobody heard of coconut oil or avocado oil. These are both good choices. It has a good nutritional value, pretty healthy, not bad at all and you can cook with both of them. They have a very high smoking point which means that you can sear, saute and cook. In the case of avocado oil, it’s very good to make salad dressing or to drizzle on a salsa, fish or shrimp.